Glover Bros was established in 1899 by Thomas Glover Waine, one of the sons of William Waine of the House of Waine. This large retail and manufacturing shop, founded in 1848, sold furniture and upholstery, carpets and drapery and everything for the home from premises in Newington Butts, near the Elephant & Castle. 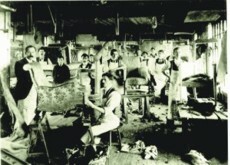 Glover Bros was set up as the wholesale arm of the business to supply upholsterers and furniture makers, later moving to the East End, then the home of furniture making. A customer is the most important person in our premises - in person or by letter. A customer is not dependent on us-we are dependent on him. A customer is not an interruption to our work- he is the purpose of it. We are not doing him a favour by serving him. He is doing us a favour by giving us the opportunity to do so. The House of Waine celebrated its 100th year in 1948 but the retail shop, bombed during the war, did not continue for long after that. Glover Bros, continued to operate in London until 1981 when its Redchurch Street premises closed and a relative reopened in Devon. In 1985 it transferred to Somerset, Des and Val Fanning took over in 1989 and the company was incorporated in 2001, 102 years after it was first founded. New, purpose built premises next to the West Somerset Railway station at Bishops Lydeard completed the journey from London's East End into the 21st century. 2010 saw a change at the top due to the retirement of the Fannings after 21 years. The current owners are Charles and Helen Petri and the company continues to meet the needs of both traditional and modern methods. The business still follows TG Waine's advice about our customers. The price list now includes over 2000 items. Glover Bros Ltd, suppliers to the upholstery and soft furnishing trades. Our Registered Office is the same as our trading address. The company reg. no. is 3726130 and our VAT no. is 991 2911 02. We are members of the Association of Master Upholsterers (AMU).